IPAMA – The apex body of Printing, Packaging and Allied Machinery Manufacturers of India. The Association is absolutely and totally dedicated to one point program: Promotion of the Indian Graphic Arts Industry. IPAMA organizes PRINTPACK INDIA, this is a biannual event happens mostly in the month of February. PRINTPACK INDIA has established itself as a launching pad for new technologies and services. 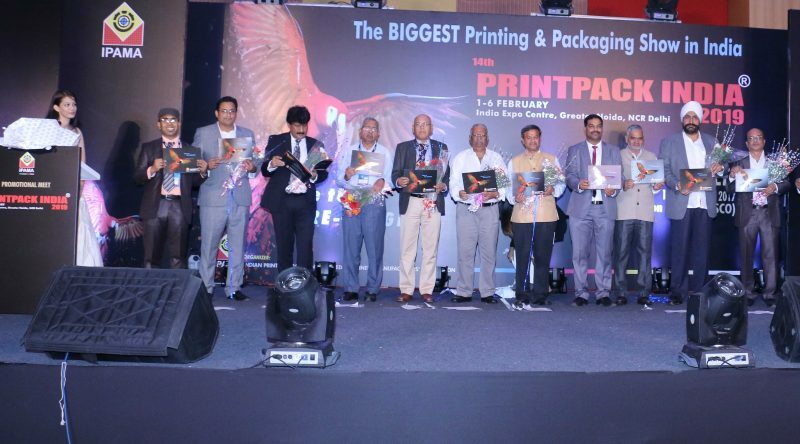 The 14th edition of its biennial flagship show PRINTPACK INDIA 2019 is scheduled to be held from February 1 – 6, 2019 again at India Expo Centre, Greater Noida, NCR Delhi. Right on the track, IPAMA is working hard to bring the Indian graphic arts industry on the global map and there is no better platform in the entire world than PRINTPACK INDIA for the same. For the Promotional Meet, scheduled to be held on 19th Dec 2017, at Bombay Exhibition Centre, Goregoan, IPAMA has invited the entire Graphic Arts Industry for the same. Apart from the road show the agenda would be to form a Federation so that the voice of the printing industry could be listened by the law makers. Indian printing industry is a huge industry and it is almost at par with the automobile sector if not bigger than it. Size of Printing & Packaging Industry : The market size of Printing & Packaging Machinery Industry is around Rs 23,931 Cr (Data 2015-16), and total turnover in 2015-16 was around Rs.16,916/- Cr. However, there is a huge gap in export and import, it is almost 1 : 5. Imports are growing at a very high rate as compared to the increase in domestic production rate. But, if we take the entire Printing Industry and Consumables it is pegged at approximately Rs. 1,90,000- Crore. India is the 5th largest Print Packaging market with revenues of US$12.2 bn (As per the Economist Intelligence Unit (EIU) study). By 2020, revenues will reach $18.6bn, just below Japan, the 3rd largest market with $19.1bn in print packaging revenues.